The best way to gauge the importance of a public event is to count the dignitaries on hand. 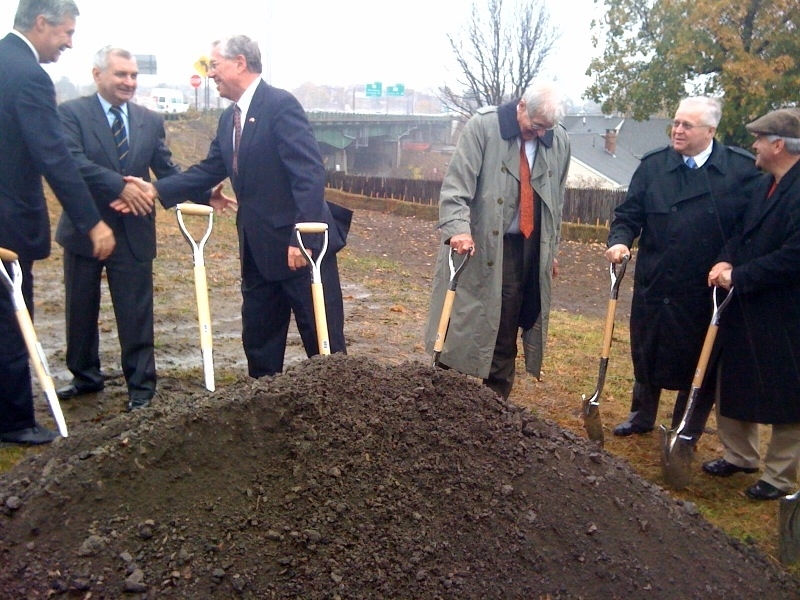 At the Pawtucket River Bridge groundbreaking this past Thursday, there were no more than … well, I lost count. Both U.S. Senators were there, so was Congressman Jim Langevin, Governor Donald Carcieri, along with mayors and police chiefs and newly minted Attorney General Peter Killmartin. All crammed into a tent with dozens of other folks pressing the flesh and grinning. Impressive given the rain that was pouring down. Perhaps it was the importance of getting the replacement bridge built that attracted the crowd. For nearly three years the I-95 overpass has been closed to heavy trucks, forcing them to worm their way around the bridge. This has caused grief to residents living just yards away from the eternal convoy trekking down the detour. Pawtucket resident Danna O’Clair lives right where trucks take Exit 27. She says the noise and vibrations are so bad that they shake the windows; she swears truck traffic caused her kitchen cabinets to shake right off the wall. Pawtucket’s mayor is also feeling the pain. He says he’s co-authored a letter with the Central Falls receiver outlining damage the truck detour has done to their cities. That letter, he said at the groundbreaking, is going straight to the dignitaries who were sitting on the front row. Truckers too are feeling the pain, some of them even stopped to hear the speeches and watch the ceremonial dirt fly. Thousands of trucks have been pulled over and ticketed for going over the bridge’s weight limit. This is costing truckers thousands of dollars and lost time on the road. Interstate 95 is the most traveled highway in the nation. The Rhode Island Department of Transportation says about 162,000 vehicles travel across the Pawtucket River Bridge every day. RIDOT’s dangling about $26,000 of motivation to get enough of the work done that trucks can return to the bridge by spring of 2012. The new bridge, with its art-deco touches and colored lights, is expected to open summer of 2013.